Index ETFs can be used for every-day fund index trading. They can be used in swing trading strategies, but these index ETF shares could also be utilized for profitable daytrading strategies. There are plenty of index ETF shares available for traders and their strategies. Different providers of exchange traded funds issued products that tracks same index. The most usable indexes for trading are S&P500 index, Nasdaq 100 index, Down Jones Industrial Average index and Rusell 2000 index. It is important to select suitable index exchange traded funds to be able to trade them during one day. The major points are good liquidity and good spreads. Based on these parameters I would recommend using only these index ETFs: SPY, QQQ, DIA and IWM for daytrading strategies. The core of my every-day fund index trading strategy is to use two major US index ETFs. 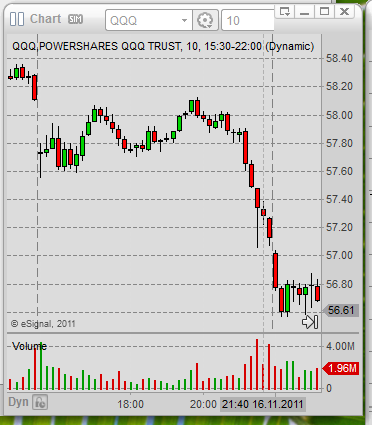 They are QQQ – PowerShares QQQ Nasdaq 100 index exchange traded fund and SPY – SPDR S&P 500 index exchange traded fund. These two funds could offer nice daytrading opportunities several times a week and in some cases also several times a day. The core of my S&P500 and Nasdaq 100 index fund day trading is built on using relative strength. Comparison of these two ETFs during first minutes of the day will determine which one is weaker and which one is stronger. The next step is to decide what the prevailing mood on the market is, if the market prefers to go up or to go down. And the final step is to find a good setup and realize the trade. The major expectation is that when the market mood is bearish and we enter a trade in the weaker ETF then we could expect bigger and quicker movement and have profits in our pockets quickly. A similar rule is used for stronger fund when the market mood is bullish. Now you have to compare both charts and especially the situation in the last minutes on both charts. 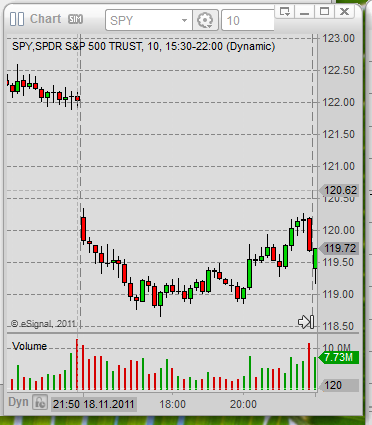 Relative strength analysis could quickly help to determine that QQQ is weaker than SPY. 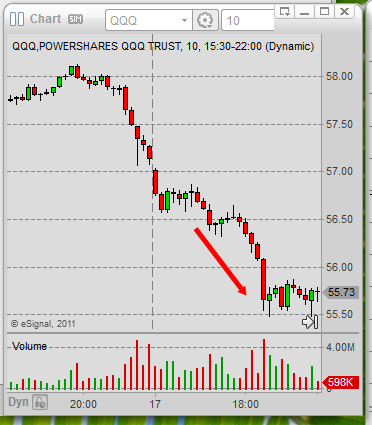 QQQ did nicely almost a 1-point drop. It was a good opportunity for daytraders. 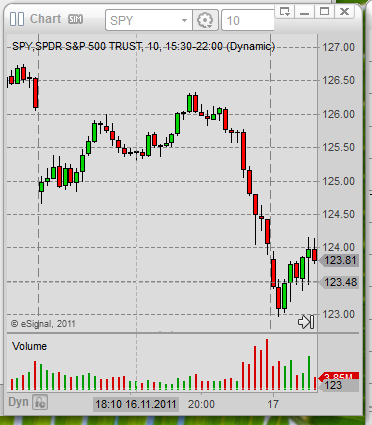 I personally do not like to apply this type of day trading index ETF strategy when the stock market has already moved a lot during pre market hours and the market opens with a big gap up or down. I feel that the emotions in the moving market are already exhausted by this huge gap movement and so there is not much left for regular US stock market hours trading. There are some day traders that use special techniques for gaps. These gap day fund index trading strategies are based on an idea that most of the gaps tend to close. It is that price from the open tends to move back to highs or lows of the previous day.